I’m sure those are the first few things that would pop into your mind when I asked you to think about what branding involves. And, while those things are all fine and dandy, unfortunately entrepreneurs miss the name of the game while getting wrapped up in the design: branding isn’t just about making your product or service look good, but also making it sound good. And that’s all thanks to the capabilities of copy. The sweet, sweet words that make up your product or service’s voice, both online and offline—peppering it into your webpages, emails, blog posts, printed materials, and everywhere else imaginable. Let’s put it this way: when you don’t have branded copy that packs a punch and you’re just slapping random words on a page, it’s like going to fix a PB&J sandwich only to realize you’re out of peanut butter. You can’t eat it without that key ingredient. Not possible. So, think of your copy as your brand’s peanut butter—the powerful glue that holds everything together. With that being said, today, I’m here to help open your eyes to just five ways you can construct an authentically awesome brand with your words. But, even after you dig into this blog post, you might feel some serious pressure to actually get to work on writing your sales content—-email sequences, sales pages, videos sales pages, you name it. After all, it’s tough to transform yourself into a modern-day Don Draper or master wordsmith overnight. Luckily, I have just the solution to help you tackle your content writing quickly and efficiently. I’ll reveal it here after we cover the good stuff—be sure to stick around. 1. Develop a consistent tone. 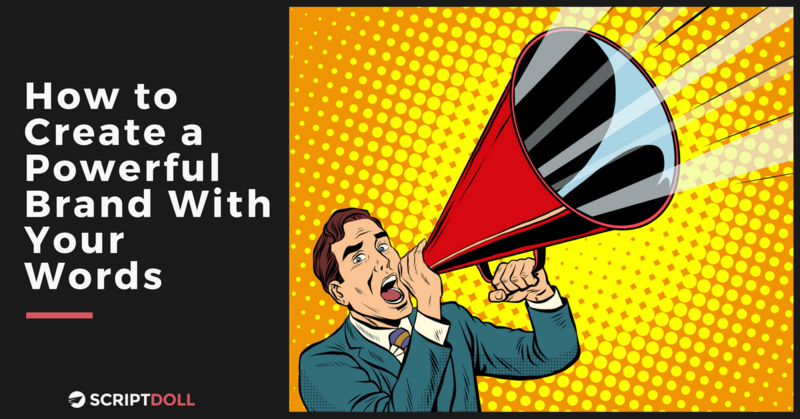 Just as your brand’s visuals and colors need to be consistent, so does your tone of voice. And that isn’t about what you say. Rather, it’s about how you say it. What are their demographics? Age, location, and so on. What is their role? CFO, small business owner, busy mom. What key personality traits will influence the conversation? Contemplative, courageous, self-critical. What are they looking for from you? Proof, comfort, guidance, support. Next, fill in the blanks of these questions The Muse offers up. Pay attention to the tone you use when filling in these blanks. Is it sassy? Funny? Formal? Whatever it is, make it unique, distinctive, and recognizable because the way you say something breeds a feeling within your readers. Your tone can help inspire emotional responses that ultimately influences purchasing decisions. Here’s a sample of how popchips nailed their tone of voice. Makes you smile, huh? Still feeling stuck on this step? Take a look at these examples for a helpful nudge in the right direction. 2. Put relationship building ahead of conversion seeking. Unless you’ve been in hibernation for the past decade, you know we live in a world full of noise. Emails piling up. Text messages pinging with distractions. Companies every which way we turn throwing deals, discounts, webinars, and everything in between in our faces. This all leads us to competing for attention at all times, making the ability to actually earn conversions way more challenging than it’s cracked up to be. That’s why it’s more important than ever to place relationship building ahead of conversion seeking when crafting your brand’s copy. Speak to their biggest headaches, tell a good story based on your experiences, and offer a Band-aid to put over their problems to serve as the remedy they need. After all, when you inject empathy, transparency, and honesty into your content, you’ll optimize your relationship with your ideal customer, not your conversions. 3. “Speak” to one person, not everyone in your audience. That one person should (obviously) fit your ideal customer profile to a T. When you’re writing, imagine you’re seated directly across from them, enjoying a chat over coffee or a bite to eat. This conversational mindset will assist you with course-correcting your copy’s focus—you’re not speaking for a crowd. Instead, you’re speaking for an audience of 1. Ultimately, if you find your copy doesn’t appeal to some of your readers, it’s perfectly okay. Don’t sweat it. It just means they don’t fit your ideal customer profile as much as you thought they did. After all, you can’t be appealing to every single person on the planet. 4. Assemble a library of words and phrases for your brand. One way to really make the task of copywriting slightly less torturous is to assemble a list of words and phrases you can pull from that align with your brand’s personality. Not to mention, a list of never-to-use words and phrases that might clash with your voice. But, in order to craft those, you need to put in some hard work—grind it out as a copy detective. That’s right. It’s your chance to roll up your sleeves and dive headfirst into your customer’s conversations. Not in business just yet? Scout out your competitors’ blog post comments or social media post comments to explore the types of words or phrases they’re using. Already up and running? Send out a survey to your list of subscribers or interview a sample of your current customers, putting out feelers for the words that really resonate with them. And, don’t forget to do a little introspection, giving your very own common words and phrases some love—the ones you catch yourself saying day-in and day-out. This’ll help you build a genuine, natural brand that’s much more connected to who you are as the face behind your company. All while making it easier for readers to cozy up to your content. Once you pass the research phase, go ahead and put all the words and phrases in writing, focusing on 3 overarching and exciting umbrella words, with a few descriptors under each. Take a look at The Marketing BFF’s 3 brand words as an example. When you’ve landed on your leading words, begin injecting them into your copy. If you feel like you’re repeating yourself far too often, you’re on the right track to nailing your messaging. How else did you get L’Oreal’s “Because You’re Worth It” or State Farm’s jingle stuck in your head? It’s because you heard it 5,000 times. No matter what feels right for your brand’s copy, just run with it. Don’t nail down your writing and then start looking at competitors who have a different tone than you as the stencil for success. That’ll just lead you to a perpetual rollercoaster of edits to your voice that most likely don’t need to be made. Be your own brand. Be unique. And consider your voice to be the “onlyness” factor your brand needs—making you different from all the other carbon copies out there as a result of comparing your brand to someone else’s. And, once you get rocking and rolling with your copywriting, explore these tips to ensure you produce copy that actually converts. Wishing you could transform yourself into Don Draper or a master wordsmith overnight, making writing all your sales content easy as pie? Don’t we all. Unfortunately, we all can’t quickly become masters of this craft. You can dish out buckets of money to join courses in an attempt to do so, or hire copywriters to take over your workload for you. But, I found a much better solution to swiftly put an end to all of that. A solution that, once you tackle the branding basics, frees up your writing time and eliminates feelings of frustration when you don’t get the sales numbers you were expecting in return. And, that solution is ScriptDoll. It’s a one-of-a-kind piece of software that helps entrepreneurs like you craft sales copy for any product or service offering. Plus, it takes all the guesswork out of the writing process so you can keep your head out of the weeds and focus on the success and growth of your business. Frees up your time to put focus towards more productive tasks—simply complete your product portfolio, answer a handful of painless questions regarding your product details, features and benefits, and more, and ScriptDoll turns your answers into engaging copy in a matter of minutes. Keeps your content fresh with an ever-growing, extensive library of templates—new templates are added on a monthly basis, from sales letters to email sequences, video sales scripts, native ads, and much more. You’ll avoid putting your audience into a zombie state-of-mind, steering clear of sharing the same thing over and over again. Swipe Irresistible Copy for Your Brand in Minutes—Join ScriptDoll Now! It’s time for you to go forth and speak clearly in your copy to create not just an authentic brand, but also an irresistible one. And, you’re now in the loop on a tool that can help you rapidly inject your brand voice into sales content pieces that actually get you the sales numbers you were hoping for. Entrepreneurs like you are raving about ScriptDoll—relieving them from the struggles of ho-hum writing while kicking their conversions up a few notches with little to no effort. We hope you’ll join them and look forward to you getting the results you’ve been searching for. They’re ready and waiting for you. Have questions or something to share on the topic of how to build a strong brand with copywriting? Drop us a line in the comments section below.